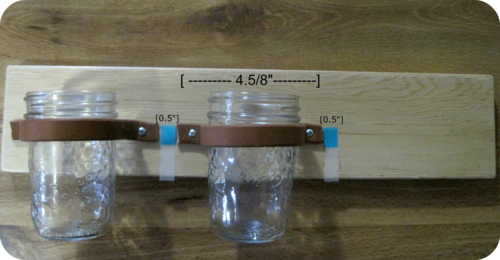 DIY: Make 'Em Hang - Mason Jar Organizer! I think I say this every time I do a DIY but this one is seriously the best. 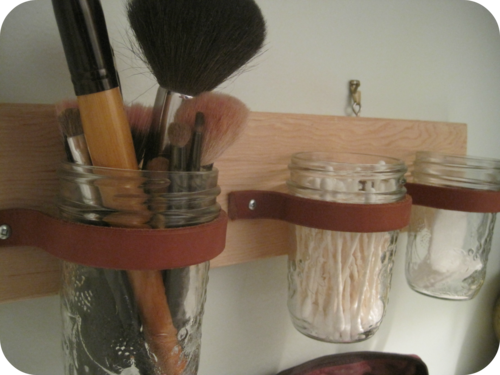 It was easy and cheap to make and is a great organizer for the bathroom or any cabinet. I might start re-working it for different spaces depending on what I need to store. You will also need to cut a board that is roughly 16" by 3.5". 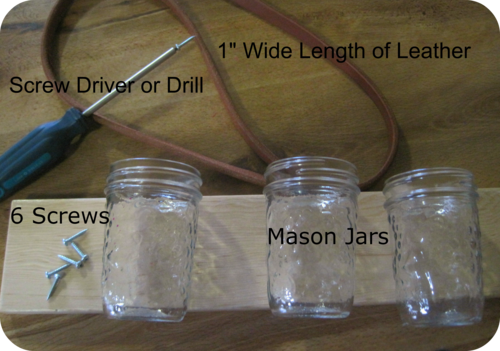 The size and thickness of the wood is entirely up to you as it will depend on where you are mounting the project and what size mason jars you choose to use. I put a varnish on my wood but you could also paint it or leave it raw depending on the look you are going for. After your wood is ready, you need to figure out how much leather you will need. Secure one end of the leather down with your finger or with a screw then wrap it tightly over the mason jar (just under the threading) and press it down against the wood on the other side. Leave enough room for the screw and any remaining decorative leather then cut. Make sure you have a very snug fit otherwise your jar will slip right out. Assuming you are using the same size jars, cut the other two lengths to the same size. Next you need to figure out your spacing. This will be different for every person depending on the size of the wood and the mason jars. The first step is to figure out how much space there is from one side of the leather to the other side when it is fit snugly over the jar. From there, space everything out evenly. Go ahead and start fastening the leather down. It works best if you do this with the mason jar secured under the leather so that you know everything is tight enough. I was able to use a screw driver but it is much faster if you have a drill. The last step is to add little hooks to the top so you can secure your project to the wall. I used little loop hooks and picture hanging hooks. There are lots of options for this step depending on where you are hanging your project. I hope you like this as much as I do. It was so easy and has the potential to be so versatile in its design and function.